Hunter Codding, 4, bonds with his service dog, Indy, at Fowler Park on Luke Air Force Base. Hunter was born with optic nerve hypoplasia, which causes blindness due to underdeveloped optic nerves. Indy is an 18-month-old female Golden Retriever who was recently awarded to the Codding family by an Arizona-based nonprofit organization. A Luke family was recently awarded a service dog from a local nonprofit organization for their 4-year-old son, Hunter, who was born with optic nerve hypoplasia. The condition results in blindness due to the underdevelopment of the optic nerves. Hunter is able see colors, but much of the world around him remains a mystery, according to his mom, Staff Sgt. 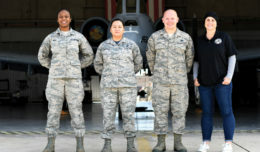 Jasmine Codding, a 56th Maintenance Group analyst. The family hoped to get a service dog for Hunter, but the high cost prevented them from making the wish come true. The cost for a trained service dog can run upward of $25,000. With an opportunity in sight, Jasmine and her husband, Staff Sgt. Dylan Codding, 56th Security Forces Squadron patrolman and a native of Normal, Illinois, began the arduous task of saving enough money to give their son a better quality of life. It wasn’t long before the family received an unexpected phone call from Luke’s Exceptional Family Member Program office. The EFMP office, whose mission is to support military families with special needs, received word from the Foundation for Service Dog Support, Inc., an Arizona-based nonprofit organization, that a free service dog was available to be awarded to a military family. 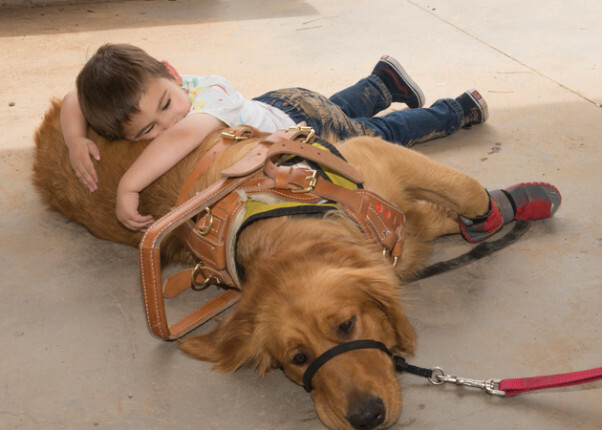 Hunter met his soon-to-be service dog, Indy, a female 18-month-old Golden Retriever, in April after her service dog training graduation at Centennial Plaza in Peoria. “When Hunter met Indy it was an instant connection,” she said. After Dylan and Jasmine completed two months of online training and a once-a-week, four-hour-long hands-on training class with Indy, the Coddings became a family of five at the end of May. Once Indy is fully integrated into the family, Dylan and Jasmine hope she can help Hunter both with his blindness and his social skills. Jasmine said Hunter has difficulties interacting with his peers. The Codding family is one of many success stories the EFMP office helped come to fruition. The Exceptional Family Member Program at Luke is always searching for ways to support more families with special needs, to include connecting them with schools and support services, holding support groups at the Airman and Family Readiness Center, and hosting on- and off-base events. “Our goal is to make sure our families feel connected to other families in similar situations and for families to feel they are part of the Luke community,” said Marjorie Thompson, A&FRC EFMP coordinator. Luke families who need support should contact EFMP coordinators Senaida Larson or Marjorie at the A&FRC at 623-856-6550. Those seeking to enroll a family member in EFMP should contact Melody Jones, 56th Medical Group, at (623) 856-4164. 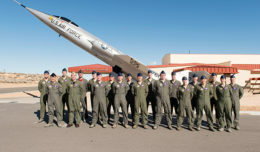 The Airman and Family Readiness Center contributed to this article.